Need assistance booking a ride? - Book Your Ride Online Today and Save Up To 30% on Airport Transportation. It’s easy! Thanks for great service. We will use you again when we are next in town. Good morning! I want to let you know that the trip was great, our driver was prompt and attentive. Hello NYCLimo team - The first transfer worked smoothly, everything went great. Many thanks! Just posted a message on tripadvisor and wanted to make sure you look out for it. We had a great experience today. Thank you for the wonderful service you provided for us. The driver, Aaron was great. We are very happy with your services in New York City for Dr. Mehler, the CEO of our company. Thanks for the trip to Belmont in Sprinter Van. The driver was EXCELLENT! Dear NYC Limousine - The driver, Alex, was fantastic. He was courteous, friendly, knowledgeable, patient, and flexible. Everything we wanted in our driver. * Here are our current one-way rates from John F. Kennedy International Airport (JFK) to Manhattan. To start the booking process, please enter your itinerary and click on the Calculate My Ride button to view the rates and vehicle availability for your travel date and time. Book your reservation online today and get 15% discount! The luxury sedan offers ample leg and head room, and can accommodate up to four adult passengers. The luxury sedan luggage capacity is two standard checked bags plus two carry-on's. Book your reservation online today and get 10% discount! Our luxury SUV deliver ample space without sacrificing style. Seats six adults plus six standard checked bags. The Mercedes-Benz S-Class, E-Class and R-Class are synonymous with state-of-the-art luxury and safety vehicles. As Mercedes' largest sedan and crossover, they offer the most room for rear-seat passengers. 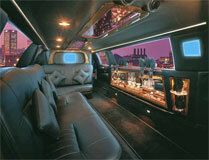 This luxurious stretch limousine seats six passengers comfortably. 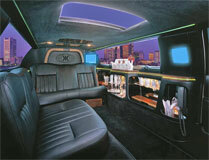 The limousine comes equipped with flat screen TV/DVD, state of the art sound systems, walnut bar and fiber optics. This luxurious Stretch Limousine seats 8 passengers comfortably. Car comes equipped with flat screen tv/dvd, state of the art sound systems, walnut bar, fiber optics. This luxurious Stretch Limousine seats 10 passengers comfortably. Car comes equipped with flat screen tv/dvd, state of the art sound systems, walnut bar, fiber optics. 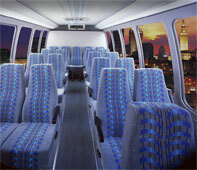 The 9 passengers van is ideal for airport transportation. This van can seat 9 passengers with 9 standard checked bags plus 9 carry-ons. It has a front and rear air conditioning and tinted windows for your comfort and security. 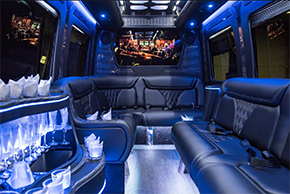 The Limo Van provides the most inviting interior for passengers to settle into. This van can seat fourteen adults with plenty of room luggage. This van has front and rear air conditioning and tinted windows for your comfort and security. 14 Passenger Limousine Van. Black exterior, black Leather Interior, tinted Windows, USB port to play your music and onboard Wi-Fi. 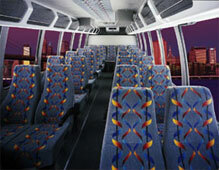 Our stylish air-conditioned minibus seats twenty-four passengers in comfort with plenty of room for luggage. This minibus is perfect for airport shuttle, corporate travel, wedding party guest’s shuttle and sightseeing tour through New York City. Our stylish air-conditioned bus seats thirty-six passengers in comfort. This bus is perfect for airport shuttle, corporate travel, wedding party guest’s shuttle and sightseeing tour through New York City. Our 56 passenger buses are equipped with lavatory, TV with DVD, PA system, air conditioning and plenty of leg room for your comfort.